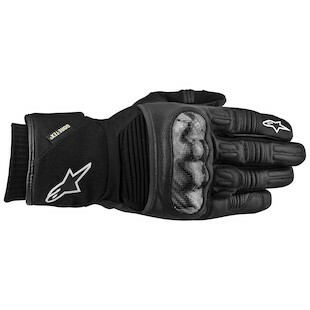 The New Alpinestars Cold Weather Gloves stick it to mother nature and make peace with the multi-season sport and sport touring community. There is no Twix, but welcome to your candy lineup. 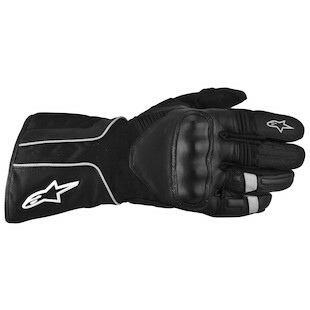 The Alpinestars Tech Road gloves are the top of the line in Gore-Tex waterproofing, cold weather gloves. Made of goatskin leather for abrasion and tear resistance, a leather and suede reinforced construction makes them extra durable. Insulation has been added to the top and side surfaces of the fingers for added warmth while a taffeta lining makes entry and exit from the glove easier. The index finger has a touch screen stylus for use on a GPS. The EVA inserts have increased impact absorption and palm sliders for abrasion resistance. A TPR visor wiper is on the left thumb and the wrist has a double closure. 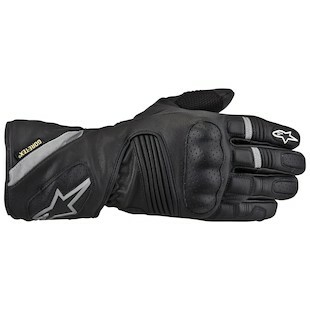 The Alpinestars Jet Road Gore-Tex gloves are a waterproof, gauntlet glove built with a blend of leather and textile. Made of a high abrasion fabric and goatskin leather for abrasion and tear resistance, the Jet Road also use advanced EVA inserts to increase impact absorption. The molded knuckle protectors have built-in shock resistance. The gauntlet has a twin-wrist designed to close the jacket sleeves and seal out the elements while a water drain eyelet system on releases any water caught in the double-cuff. As with the Tech Road, the Jet Road gloves also have the TPR helmet visor wipe and touch screen stylus. The Alpinestars Polar Gore-Tex gloves don't look wintry at a 3/4 length. Instead, they have a sportier appeal and were made to be worn under your jacket sleeve. Constructed of goatskin and a high abrasion fabric, suede reinforcements provide superior durability and grip. These gloves also have high-density padded inserts, a touch screen stylus, and a double wrist closure. A chamude (type of leather) snot patch lines the outside of the left thumb along with a visor wiper. 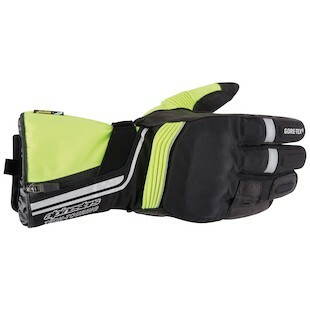 The Alpinestar WR-3 Gore-Tex gloves are made of goatskin and have a full gauntlet that's intended to be worn over your jacket. It's not as heavily insulated as the Tech Road, Jet Road or Polar gloves, but it does have enough insulation on the top of the glove and the sides of the fingers to serve well as a three season glove. Like the other gloves in the line, it has a visor wipe, knuckle protectors, reflective strips and accordion inserts on the fingers and top of the hand for flexibility. This glove is available in women's as well, the Stella WR-3. 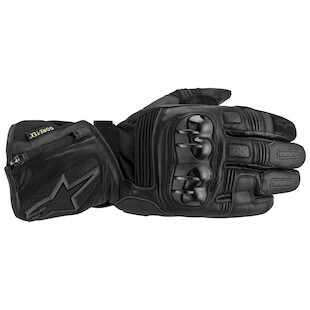 The Alpinestars Overland gloves are a Drystar waterproof glove without medium strength insulation. Made of goatskin with suede reinforcements, they are highly abrasion resistant. EVA inserts increase the impact absorption. Other features that mirror Astars other gloves include accordion inserts on the fingers and top of the hand, molded knuckle protectors and reflective details. Don't miss the jacket and boot lineup.